2 2. Write Genesis 1:28 in your own words. 3 3. List four factors that have caused animals to become endangered. 4 4. Name four animals that are now extinct. 5 5. List four things that are being done to save endangered animals. 6 6. List four activities you can do to help wild animals. 7 7. List ten endangered animals. Tell where they live and why they have become endangered. 8.1 a. Visit a zoo or animal preserve that has one or more endangered animals in residence. List what animal(s) you saw, where they normally live, and why they have become endangered. 8.2 b. Watch a video about an endangered animal. List what animal(s) you saw, where they normally live, and why they have become endangered. 8.3 c. Choose an endangered animal and write or give orally a short report about it. Tell where it normally lives, why it has become endangered, what is being done to save it, and any other special details about this particular animal that you have learned. 8.4 d. Make a scrapbook about endangered animals. This may include newspaper articles, stories, pictures, stamps, or drawings. This may be a group project. 8.5 e. Do an environment circle. A species which is at risk of becoming extinct because it is either few in numbers, or threatened by changing environmental or predation parameters. A species that has died out completely. When the last specimen dies, that creature is said to have become extinct. A specific place or the natural conditions in which a given species lives. Any major regional biological community such as that of forest or desert. This "chain" can be described as follows: Killer whales (Orca) feed upon seals, that feed upon squid, that eat small fish, that feed on copepods, that feed on microscopic algae. A person who illegally hunts an animal in order to kill it. 2. Write Genesis 1:28 in your own words. Genesis 1:28 is presented below in several translations. It might help to have your group read several versions of the text before they attempt to put the verse in their own words. God gave them his blessing and said: "Have a lot of children! Fill the earth with people and bring it under your control. Rule over the fish in the ocean, the birds in the sky, and every animal on the earth." 3. List four factors that have caused animals to become endangered. The most common threat to endangered animals is the destruction of their natural habitat. Deforestation one way that habitat is destroyed. Rain forests are cut down for many reasons, including the sale of lumber, clearing for agriculture, or gathering wood for fuel. Human encroachment into wild areas for development of agriculture, industry, and housing is another common cause for species endangerment. Building dams can prevent many species of fish from swimming upstream to spawn, and this disrupts their lifecycle. The construction of pipelines has a similar effect on land animals, preventing predators from accessing areas containing their prey, or isolating animals from other members of their species, thus reducing the amount of genetic material available to the population as a whole. An invasive species is a non-indigenous species (e.g. plants or animals) that adversely effect the habitats they invade. They can endanger indigenous populations by preying on them or by out-competing them for resources such as food. A good example is the Brown Tree Snake of Australia. The Brown tree snake was a stowaway on U.S. military transport at the end of World War II. The slightly venomous, but rather harmless, snake came north to Guam and killed almost the entire native bird population on the previously snake‐free island. This snake has few predators on the island, although these do include pigs and monitor lizards; nowadays, Guam is one of the areas with the highest snake density in the world (an estimated 2,000 snakes/km²). 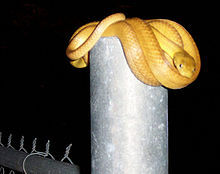 Even so, this nocturnal tree snake is rarely seen by residents. They curl up and hide during the day, and move about on trees and fences at night. At least eight Brown tree snakes have been found in the Hawaiian islands since 1981. Because they can cause the same amount of harm to Hawaii as they have done to Guam, the State of Hawaii makes concerted efforts to inform the public about the snakes, particularly at Honolulu International Airport. A seashell vendor in Tanzania sells seashells to tourists. Many animals are endangered because of poaching. Elephants are killed for their ivory. Rhinoceroses are killed for their horns. Bears are killed for their gallbladders. Tigers and other large cats are killed for their skins. The dodo was an animal hunted to extinction by European hunters. It wasn't long after Dutch colonists settled on the island of Mauritius in the 17th century that the hapless dodo was driven extinct. Since then, dodo researchers haven't had much to work with other than a handful of composite skeletons in museums and anecdotal reports from early mariners. More has been written about this bird than practically any other, yet researchers practically know nothing about it. Pollution can kill off a species very rapidly, by killing all living members through contamination or sterilizing them. It can also occur over longer periods at lower toxicity levels by affecting life span, reproductive capacity, or competitiveness. DDT played such a role in killing off bald eagles and other birds by thinning the egg shell walls of affected birds, thus lowering the survivability of offspring. Since this effect was discovered, DDT has been banned in many parts of the world and affected bird populations are recovering. 4. Name four animals that are now extinct. 5. List four things that are being done to save endangered animals. Endangered Species Act for the USA. Reintroduction of species to an area. Treaties that ban the trade of products made from endangered species. 6. List four activities you can do to help wild animals. Make a "Save the Animal" poster and display it. Have a panel discussion Endangered Species vs Development. Make a bulletin board display. Make an Endangered Species craft project. One of the more obvious things to do is to refuse to purchase items made from endangered animals, such as ivory. Even though the trade in these items poses a significant threat, there are more subtle things that we do that has an even greater impact. We are not often faced with the option of purchasing a tiger skin or an ivory trinket, but we are often tempted to engage in other behaviors which are just as destructive. Reduce your consumption levels. Today's rate of consumption of natural resources is unsustainable. 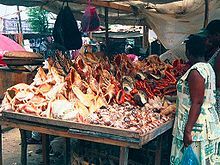 Consumption of goods puts a stress on the environment, as ultimately, that is where all raw materials come from. Avoid purchasing disposable items, and buy reusable items instead. If you own a boat or a personal watercraft, it is important to inspect it before you tranport it between different waterways. The zebra muscle is an invasive species that is currently spreading west in the United States and Canada. These creatures spread by "hitching a ride" on boats that are transported between non-interconnected waterways. Inspecting your boats and removing all wildlife (plants and animals) from them can help prevent the spread of invasive species. Do not buy or keep exotic animals. The snakehead fish became infamous in the US because of their appearance in a pond in Crofton, Maryland in 2002. They are prohibited in several other countries like Australia because their introduction to new ecosystems may displace indigenous species. Humans have been introducing snakeheads to non-indigenous waters for over 100 years. In parts of Asia and Africa, the snakehead is considered a valuable food fish and is produced in aquacultures. Due to this fact it was introduced either on purpose (fisheries motivation) or by ignorance (as was the case in Crofton). Sometimes exotic pets escape or are released into the wild when they are no longer wanted. This can have a negative impact on native species in the area. It is illegal to release exotic pets into the wild in most localities. Hold an Arbor Day tree-planting party. Restore a riverbank by replanting native species (under proper and knowledgeable supervision) and picking up litter. Plant a garden at your school, church, or home to attract wild birds and butterflies. Adopt a stream, wetland, or other waterway. Monitor which species use the area and try to get an idea of how many individual animals are involved. Distribute your findings. Participate in the Christmas bird count, a birdathon, or in a Feeder Watch. 7. List ten endangered animals. Tell where they live and why they have become endangered. When teaching this honor to a group, you could go to the library ahead of time and check out several books on the various endangered animals, or on endangered animals in general. You will need enough books so that each Pathfinder can have one (or they could share them in groups of two), and you need to make sure that you have information on at least ten endangered animals. You could instead bring in a set of encyclopedias. During class, pass the books around and have each Pathfinder look up the information on the animal featured in that book. It is important that the Pathfinders do this research themselves rather than having it handed to them. Below are some well-known endangered mammals (although mammals are not the only type of endangered animals). a. Visit a zoo or animal preserve that has one or more endangered animals in residence. List what animal(s) you saw, where they normally live, and why they have become endangered. This activity is probably the one that your Pathfinders will enjoy the most. If you choose to do this one and activity 'b', try to do activity 'b' first, as that will make this one more educational. If you choose to do this activity in conjunction with activities 'c' or 'd', do this activity first so that the Pathfinders may use the trip to the zoo to gather materials and information. b. Watch a video about an endangered animal. List what animal(s) you saw, where they normally live, and why they have become endangered. Below is a list of videos you might be able to use. These have not been reviewed by the authors of this answer book so you may want to screen them before showing them to your Pathfinders. If you have seen any of these, please edit this section with a review. c. Choose an endangered animal and write or give orally a short report about it. Tell where it normally lives, why it has become endangered, what is being done to save it, and any other special details about this particular animal that you have learned. You may wish to do this activity after doing activity 'a' or 'b', as both of those will allow your Pathfinders to gather information, materials, and inspiration for completing their reports. d. Make a scrapbook about endangered animals. This may include newspaper articles, stories, pictures, stamps, or drawings. This may be a group project. If you choose this option, be sure to look over the Scrapbooking Honor as well, as this activity could be used to meet requirement 9. This option works best when completed after doing activity 'a'. Be sure to have your Pathfinders each bring a camera to the zoo and take plenty of pictures. Remind them that they should restrict the photos in their albums to endangered animals. Also, if they are going to complete the Scrapbooking Honor, they will need enough material for 12 pages. This option can be also completed without a trip to the zoo by using magazine clippings, drawings, or photographs downloaded from the Internet, etc. e. Do an environment circle. With a group of 10-20 persons, form a loose circle with people evenly spaced within. Have each person represent something in the environment such as animals, grasslands, forests, etc. Then take a spool of heavy thread or string and connect each person to others in the circle. Have the leader start cutting the connections and start taking individuals out of the circle and see how the remaining persons are affected by the loss. Help the group to see that each thing in nature is very necessary to the survival of everything else in nature. This page was last edited on 31 July 2017, at 00:44.